Red Mountain Family Services’ Luggage for Kids received a $10,000 donation from the Valero Energy Corporation on January 30th, the largest single donation in the history of the Rio Rancho non-profit. 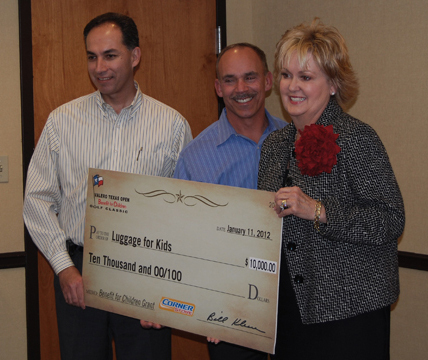 The Luggage for Kids program provides a piece of luggage for children across New Mexico who enter the state’s foster care program. Prior to the non-profit’s launch in 2008, children’s belongings were transported to their foster home in a black plastic garbage bag. Executive Director Cindy Clark-Thompson received the check from Pete Linton, Vice President of Operations, for Valero’s southern US region, and Ron Stroupe, New Mexico zone manager for Valero. Valero Energy Corporation operates 16 refineries, producing 3 million barrels of oil daily; employs nearly 21,000 workers; and operates about 1000 Corner Stores. What began as a small golf tournament to benefit a San Antonio charity is today a nationwide effort to improve the lives of children. The Valero Texas Open Benefit for Children Golf Classic, a project of the Valero Energy Foundation, has proudly delivered millions of dollars to children’s charities in the U.S., Canada and the Caribbean since 2002. Funds are distributed to children's charities in the communities where Valero has major operations. Valero also made a donation of $25,000 to The Cody Unser First Step Foundation, dedicated to raising research funds, public awareness and quality of life for those affected by spinal cord paralysis. For more information, contact Cindy Clark-Thompson at 505-994-0364 or Shelly Unser at 505-999-9550.